A morning workshop featuring some of our college’s top alumni, designed to inspire our students to enter the workforce with confidence and impact. See below for a list of panelists. Kirsten P. Flanik, ADV 1989, is the Managing Director of BBDO New York. In addition to her agency responsibilities involving training, mentoring and overall account management, Kirsten oversees the Mars business (which includes more than a dozen of the company’s major chocolate, pet and food brands), FedEx, GE, ExxonMobil, and the agency’s public service efforts in support of Autism Speaks. Since joining BBDO in 2006, Kirsten has been named a “Woman to Watch” as well as one of the “100 Most Influential Women in Advertising” by Ad Age. Her efforts to help reinvigorate the Snickers brand behind the launch of the “You’re Not You When You’re Hungry” platform have gone on to win multiple industry awards including Effies and one of the inaugural Cannes Lions for Effectiveness. Outside of her day-to-day responsibilities, Kirsten serves on the board of Somerset Hills Learning Institute, one of the premier institutions for children with Autism, is a member of Advertising Women of New York and BBDO’s Women Leadership Council, a group dedicated to helping women succeed in the workplace. Kirsten is a 1989 graduate of the University of Florida. She currently resides in Brooklyn with her husband and their two children. Ava L. Parker, JOU 1984, leads Palm Beach County’s largest higher education institution with a strategic approach emphasizing innovation, student success, and business and community collaboration. Parker is the first female president in the history of the institution, which opened in 1933 as Florida’s first public community college. Growing with the county, the College now offers more than 130 programs of study, including bachelor’s and associate degrees, professional certificates and career training. Serving 48,000 students annually, Palm Beach State has earned national distinction as an Aspen Prize Top 150 U.S. Community College. Rebecca H. Patterson, JOU 1990, is the chief investment officer for the Bessemer Trust Companies, with overall responsibility for investments, including asset allocation, strategic portfolio direction, and research. She is a member of the firm’s Management Committee. Prior to joining Bessemer, Ms. Patterson was chief markets strategist at J.P. Morgan Asset Management. She joined J.P. Morgan as an investment bank research analyst and later became the global head of foreign exchange and commodities for the private bank, working in the U.S., Europe, and Asia. Prior to her career at J.P. Morgan, Ms. Patterson was a journalist who covered politics, economics, and financial markets for Dow Jones and the Associated Press in the U.S. and Europe, as well as the St. Petersburg Times. She is a member of the Council on Foreign Relations (CFR), the New York Federal Reserve’s Foreign Exchange Committee, the Economic Club of New York, the University of Florida Investment Corporation’s Advisory Board, and the Committee of 200. Additionally, Ms. Patterson is a regular CNBC contributor. American Banker named her one of “The 25 Most Powerful Women in Finance” in 2014 and 2015, and Private Asset Management recognized her efforts in the industry as one of the “50 Most Influential Women in Private Wealth” in 2015. The Family Wealth Report named Ms. Patterson the Leading Woman in Wealth Management in 2016. Ms. Patterson earned a B.S. in journalism from the University of Florida, an M.A. in international relations from The Johns Hopkins University School of Advanced International Studies, and an M.B.A. from New York University. WUFT-TV Multimedia News Manager Bridget Grogan, TEL 1986, MAMC 1992, will serve as the moderator. She is a broadcast professional with commercial television experience as a reporter and news anchor in several news markets. Jaime Harsell is the Assistant Director of Industry Education and Experience at the Career Resource Center at the University of Florida. She is the embedded liaison to the College of Journalism and Communications where she partners with the Knight Division to offer career advising and industry education to students, as well as, establishing relationships with employers to recruit CJC students for full-time employment opportunities. She is a native of Missoula, Montana, but relocated to Florida from San Diego, California. She is a United States Navy veteran and as a first generation college student. Jaime earned dual Bachelor of Arts Degrees in Political Science and Economics and a Master of Educational Leadership from the University of North Florida. She will begin her PhD in Higher Education Administration with a minor in Policy in the Fall of 2016. She has prior experience in academic advising, and employer development, as well as, industry experience in government, healthcare, construction management. 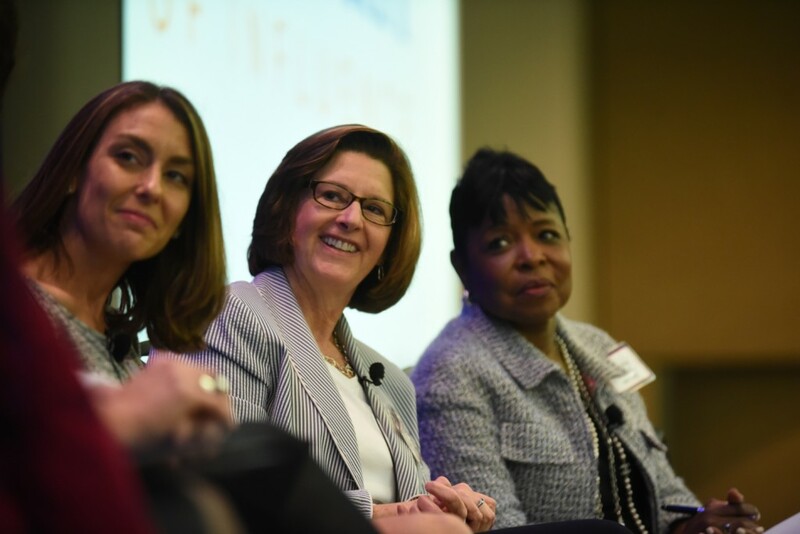 See what happened last year at Becoming Women of Influence 2015. “Always ask for what you want. If you don’t ask, you don’t get. Be humble but assertive.” – Leigh Radford, Becoming Women of Influence 2015. Read the top 10 lessons public relations student Sarai Cruz learned at Becoming Women of Influence 2015. “You get to change the world when you allow your voice to be heard” – Gale King, Becoming Women of Influence 2015. “Once you have your first job and perform it well, jobs come to you.” – Katherine Green, Becoming Women of Influence 2015. “(I) have a notepad full of words of wisdom. Thank you to the #ufBWI panel!”- Lesly Parra, student at Becoming Women of Influence 2015.